Within the context of initial and lifelong learning, the aim of EAPRIL is to develop and promote learning and professional development of individuals, teams, organizations and networks. EAPRIL wants to promote and develop educational and training practices in educational, business and professional contexts, including workplace learning. EAPRIL brings together practitioners, researchers and policy makers together in order to support Practice-Based research and its contribution to practice and theory. The association promotes practice-based research on learning in different contexts (such as HRD, consultancy and schools) and across fields (such as engineering, medicine, nursing, business and education) and at different levels (individuals, teams, organizations and networks). EAPRIL is unique by bringing together those interested in the crossroads between research & practice and professional learning & education. To find an overview of EAPRIL activities and initiatives, as well as some facts and figures, please find the quarterly EAPRIL Dashboards below. In 2006, the first Practice-based and Practitioner Research conference was organised in Leuven, by EARLI (the European Association for Research on Learning and Instruction). After the success of this first conference, two other conferences were organised, which finally led to the formal installation of EAPRIL in 2009, the European Association for Practitioner Research on Improving Learning. Since then, EAPRIL has experienced an expansive growth in terms of members and conference participants. In 2014, the merge with the former European Training and Development Federation welcomed research on learning and development in organisations. Furthermore, new activities were launched over the past years which increased learning and networking opportunities for members, e.g. 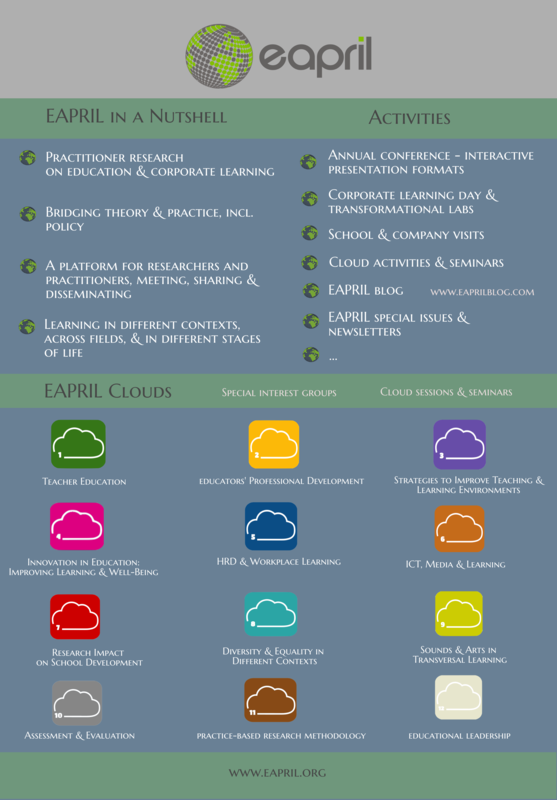 school visits, Cloud activities, corporate learning case studies, and much more. Click here to read more about the celebration of 10 years of EAPRIL Conferences!